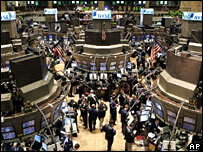 The Dow Jones index of major US shares has closed above the landmark 12,000 level for the first time. Boosted by falling US inflation, oil and petrol prices, and a number of positive corporate earnings reports, it ended Thursday up 19 points to 12,012. 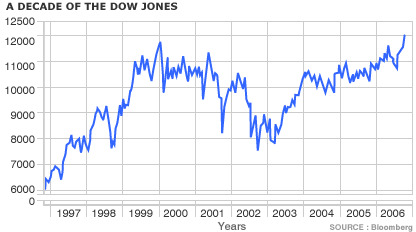 With investor sentiment upbeat, the Dow had already set record closing highs eight times during the past two weeks. The Dow, whose stocks include IBM and Microsoft, took just seven and half months to move from 11,000 to 12,000. Cola-Cola was one of the firms that most helped the Dow break the 12,000 mark on Thursday. The soft drink giant saw its shares rise 2.2% after its latest quarterly profits beat market expectations, driven by demand in developing markets. Analysts broadly welcomed the Dow's historic close, but some said they wished its large gains would spread to the other two main Wall Street share indexes - the Nasdaq and the Standard & Poor's 500 - which have lagged behind. "The Dow breaking 12,000 is more of a symbolic passage than a meaningful new high," said Eric Thorne, a portfolio manager with Bryn Mawr Trust. "It signifies a good strong market, but it's a fairly narrow index, and we would prefer to see the rally broaden out."